When a user presses the Alt key by itself on Microsoft Windows, that moves keyboard focus to the menu bar of the application having keyboard focus, and the key is not delivered to the application. 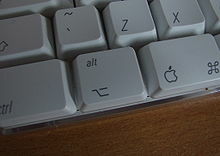 In that state, another press of the Alt key will be delivered to the application. This page was last edited on 22 April 2019, at 08:39 (UTC).